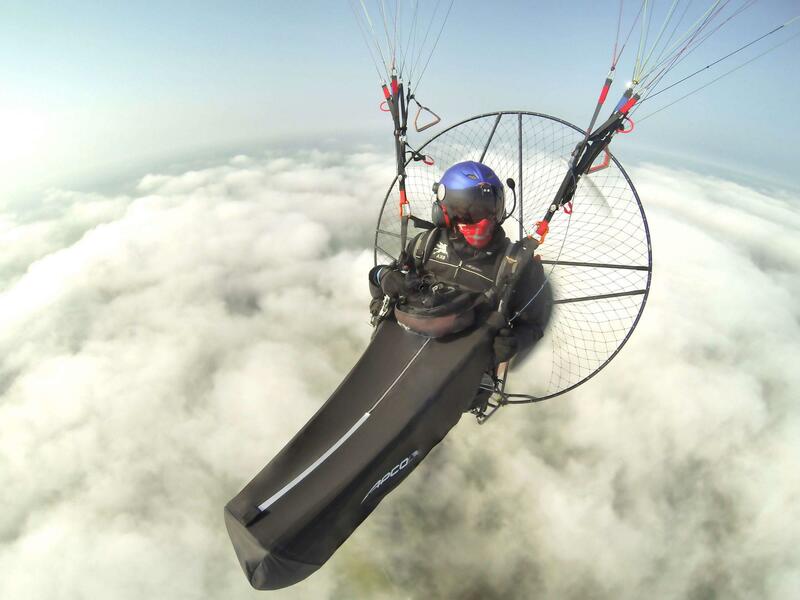 PowerPod Review by Paul Haxby - Apco Aviation Ltd.
After flying with the Apco paramotor leg pod for a few cross country flights I thought I would share my experiences. During the set up I was impressed by the overall quality with the thicker internal straps and footplate being covered with an outer stretchy light neoprene type material with an internal reflective surface, which almost acts like a stretchy skin to accommodate all the various internal leg length adjustments. The external surface seems to have a waterproof coating that is easily wiped clean as I found out when I used it in a damp muddy UK field. The outer skin is thin, light and durable and does cope with my any abrasion from my boots as I climb into the harness. The leading foot part of the pod has a cavity that inflates with airflow to create a rounded leading edge for an improved profile. The set up would be my main initial gripe as it did take several attempts to get the set up somewhere near usable, but even with this first solo effort with a slack external skin my legs were much warmer despite wearing summer trousers on a cold spring UK evening. I would suggest the set up is a two person job with a hang test because the user cannot see all the adjustments on the underneath while sat in the harness. Getting into the harness is now a little more difficult with the added equipment, but the front zip allows easy access and the ability to see what you are doing. Despite the magnet fastening failing to keep the leg pod from falling lower down my legs I was able to run during a forward launch and get airborne, but I have recently moved this fastening to the upper chest strap and this does seem to have stopped this problem. I was surprised how easy it was to get into the harness and if you need to see what you are doing leaving the front zip open during take off will help. A two and a half our flight in thermik conditions was the first true test of the leg pod and as well as the cosy legs I realised that standing on the foot plate internal section gave me, standing on terra firma, stability feeling even though the spring thermals were providing a roller coaster ride during the flight. The solid feeling was not expected and it did give me a more confident feel that was an unexpected bonus. I am not sure of the reduced drag, performance improvements yet and this will be hard to confirm how much of a benefit a cross country pilot will get, but I am sure it has got to make a difference. My only other gripe was that if you do not make sure your speed bar is inside the pod before take off it is almost impossible to get it back inside to use it during flight. This should not be a problem if you do an added pre flight check during a set up. Using the speed bar requires a slight amount of jiggling with your legs but once I latched in my heel to the red loop of the wonderbar I could easily fly at half or full bar. Landing was my only major concern and I had not completed a hang test before flying with the leg pod so I dropped my legs out well before landing and I did find it really easy as long as you retract one leg to keep the leg pod taught. For landing I just tucked the front of the pod up without fastening the front up because the material is flexible enough for plenty of movement in the half up, out of the way position. The ability to take off and get into a wind proof shell once airborne. The pod could also protect hands from wind chill. Full use of speed bar still possible (as long as you check it is secure on the inside of the pod). An added feeling of confidence during bumpy flights thanks to the solid footplate. Improved airflow and reduced drag improving the cross country potential. Another piece of kit that adds about 1kg. Requires a two person set up during a hang test. So if you enjoy cross country paramotoring and want added comfort then this is a very useful add on that can improve performance. For me the paramotor leg pod is now an essential part of my cross country paramotoring equipment. There is now an instructional manual available which is a big help for the set up but I recommend a hang test before your first flight.